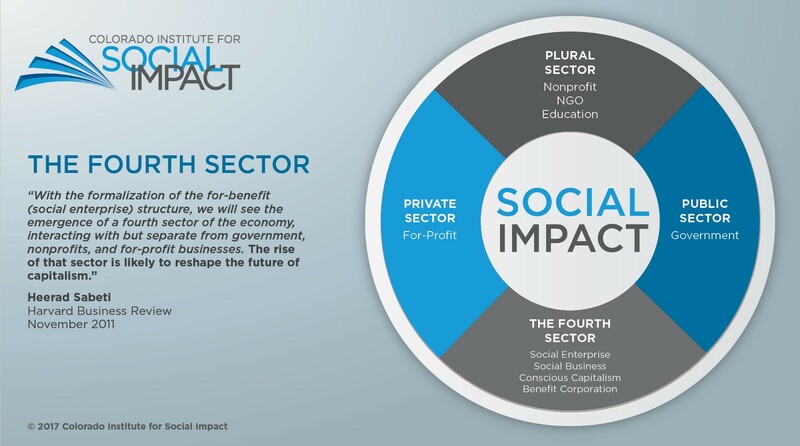 The Colorado Institute for Social Impact (CI4SI) was born from the combined passion and years of social enterprise experience from members of the Colorado Springs community. Originally founded as the Colorado Coalition for Social Impact in 2016, the organization quickly evolved into CI4SI as the community gave an incredible response to the need to organize a new, evolving sector of the economy – the 4th Sector. Colorado Springs has always had a very strong non-profit community and a robust for-profit sector; the stories and passions of local entrepreneurs inspire us to further accelerate the evolution of business. Whereas many great organizations direct their efforts overseas, we focus on the complex issues in our community. We have lands that we want to protect, and we have people in our backyard that need our help. We believe Social Impact can evolve capitalism. We believe that social impact businesses can inspire others to strive for a higher purpose. Join the Colorado Institute for Social Impact as we accelerate the evolution of business. There is a new sector of the economy that is embracing businesses that merge mission and margin, purpose and profit. This movement within business seeks to create social and environmental impact through the powerful economic engine of capitalism. This movement is reshaping the economy, capitalism, businesses and nonprofits. This model offers businesses the opportunity to actively engage in creating value that goes beyond the bottom line. 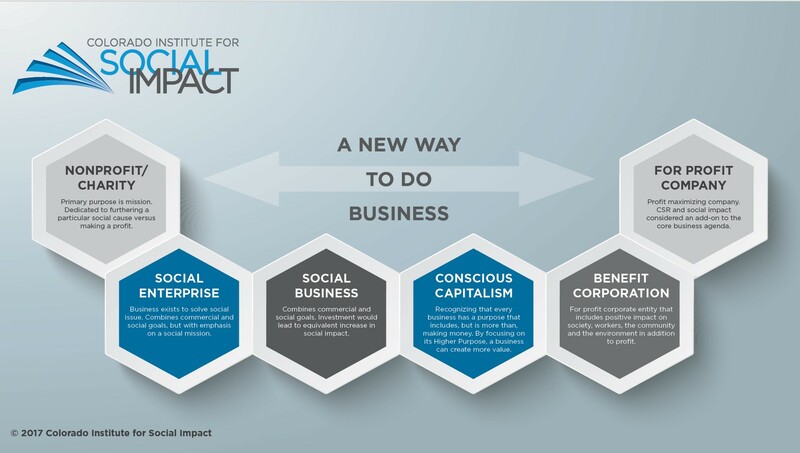 This model was developed to show the continuum of options for being a Social Impact Business. The continuum can range from nonprofit to for profit, although we believe that the tax designation should not limit a company from having Social Impact. While many businesses incorporate Corporate Social Responsibilities into their models, CSR is different from a business that incorporates Social Impact.